A recent post from Domestic Sluttery introduced me to the intriguing world of shrubbing. What on earth is shrubbing? Essentially, it's a way of preserving fruit. 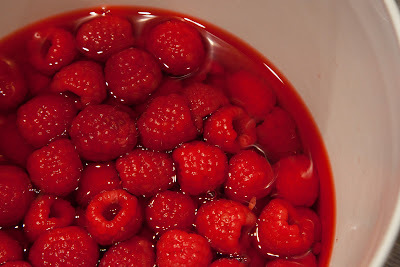 You take some fruit (I chose raspberries) and add vinegar. Let them soak for a few days. 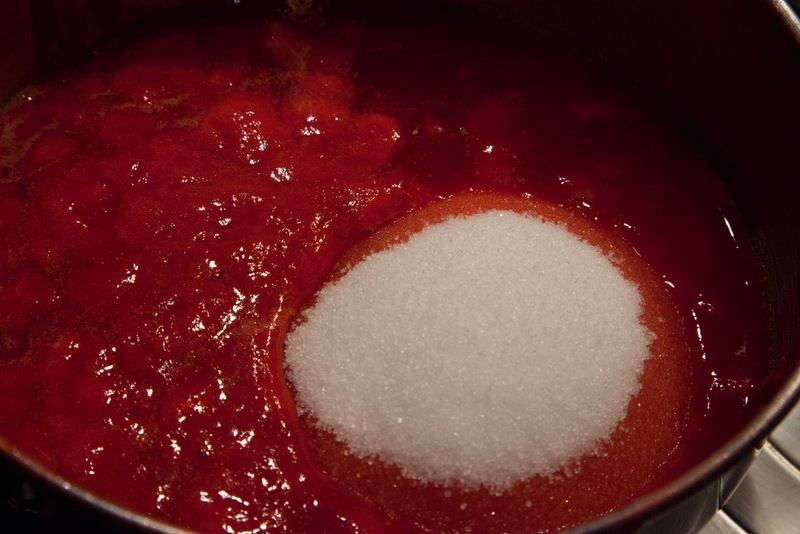 Strain the fruit and cook with some sugar. 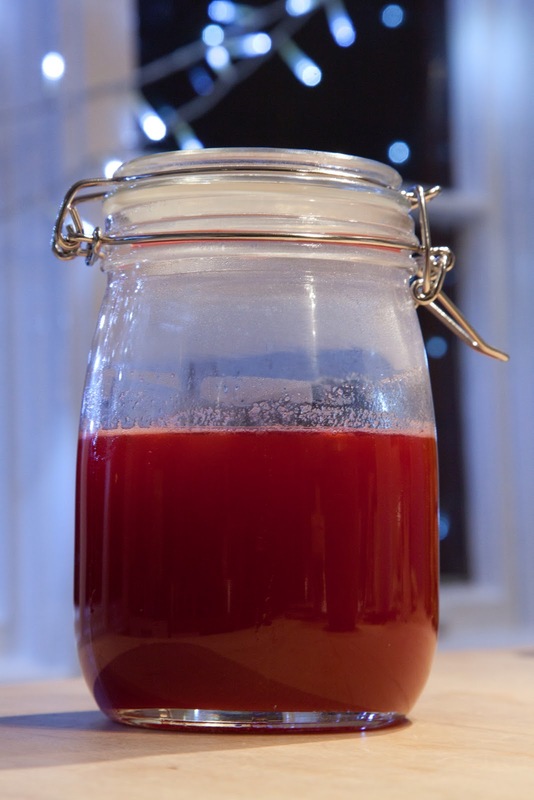 Pour the finished mixture into a jar or bottle and it's ready to drink! Wash the raspberries and pat dry. Place them into a bowl and pour over the vinegar. Feel free to crush the raspberries a little. Cover and place in the fridge for about 4-5 days. Strain the raspberry-vinegar mixture into a saucepan. Use a spoon to mash the fruit to ensure that you get out as much juice as possible. Add the sugar and bring to the boil. Leave it to simmer for about 5 minutes. Now is the time to test the sweetness of your shrub - allow 3 tablespoons of the mixture to cool and follow the 'to serve' instructions below. If the mixture is still a little tart, add some more sugar. 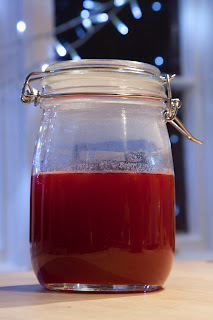 Allow the mixture to cool and then decant into some pretty bottles (or in my case a not-very-pretty-jar) and store in the fridge. 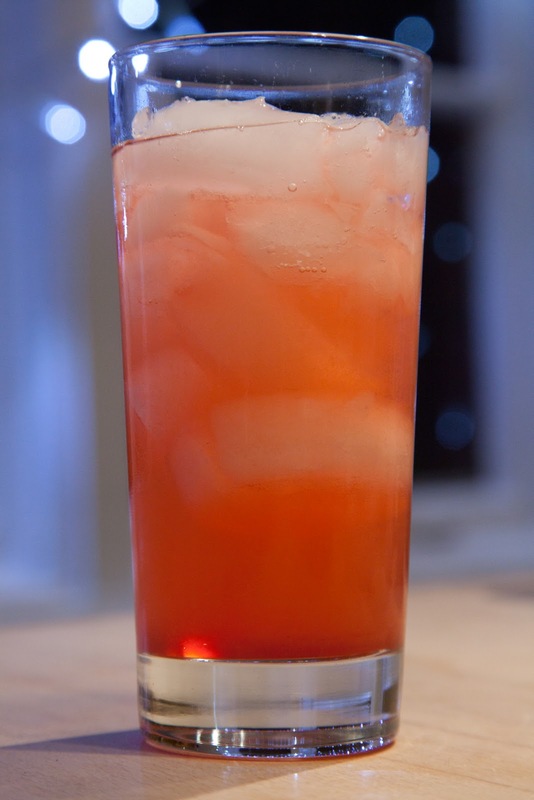 To serve: Fill a tumbler with ice and sparkling water. Add about 3 tablespoons of shrub, stir and drink! I'm sure that it will also make an excellent cocktail base, but as yet I haven't had a chance to experiment. good idea for leftover fruit - how long will it last in the fridge? The batch that I made before Christmas still looks/smells/tastes just like it did the day I made it.